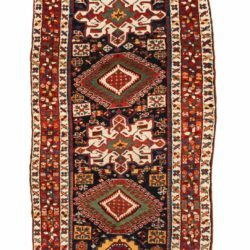 Antique Persian Bakhtiari Gabbeh 3'10"×11'2"
Runner Rugs / Antique Persian Bakhtiari Gabbeh 3'10"×11'2"
This antique Persian carpet is attributed to the Bakhtiari tribe of southwestern Iran. 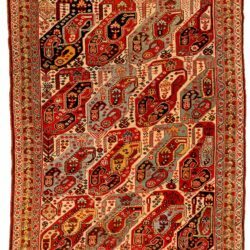 The Bakhtairi are notable both for the high construction quality of their carpets and their ability to produce both tribal designs, designs similar to city carpets and everything in between. 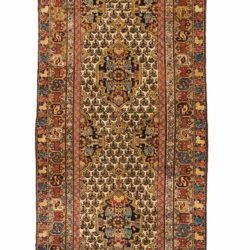 The design of this carpet is reminiscent of more developed Garden designs often seen in city carpets from Qum and Isfahan. The repeating suare figures in multple colors each possess a simple geometric figure, all sitting in an ivory field.